Size: 858 sq.ft. - 1275 sq.ft. 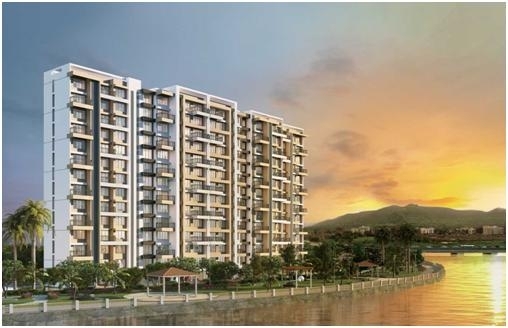 Kalpataru Waterfront or we can call riverside project is a residential structure by Kalpataru Ltd Group in Panvel, Navi Mumbai. The Waterfront has “Wing A” & “Wing B” of 117 units.These luxury apartments are configurations of 2 BHK and 3 BHK. This beautifully designed project situated along a riverside offer truly breathtaking views from its splendidly designed apartments. Kalpataru Riverside apartments imbibe a combination of luxurious comforts and contain exclusive amenities. Kalpataru Waterfront project is accessible to 2 BHK & 3 BHK Apartments with lavish balconies and a grand clubhouse with state-of-the-art amenities. This under construction single ultra-luxury tower project is will be given at the market rates. Kalpataru Waterfront will give view of green landscaping and will be faced towards a small river,surpassing cross ventilation &space management. It is standalone residential building set to have 13 floors with carpet areas ranging from 1270 square feet 1910 Sq. Ft. The Waterfront apartment floors consume huge amount of space. The 2 BHK is accommodated with unique specifications such as split air conditioning unit in the master bedroom and the 3BHK apartments feature split air conditioners in master bedroom, living and dining area. Kalpataru Group was established in 1969 by Mr.MofatrajP.Munot. One of the leading real estate development groups in India, Kalpataru Group holds 27 years of experience in development of premiumcommercial, retail, integrated townships, residential, lifestyle gated communities in Mumbai Metropolitan Region (MMR) & Pune. It has developed 80+ landmarks till date. The Group is also undertaking projects in other key cities such as Jaipur, Surat and Hyderabad. The groupis known for their modern designs and timely construction.Kalpataru Group has completed/delivered various successful projects including residential properties, commercial, religious establishments and other projects. Kalpataru Waterfront provides easy access to services like banks, ATMs, restaurants, petrol pumps, and bus and train stations. This area is home to many well-known educational institutions and hospitals. Panvel is known as the most populated city in Raigad district of Maharashtra and the gateway of Konkan region. This plush location of Panvel conveniently connects eastern side of the Mumbai to Bangalore National Highway and the Mumbai to Pune Expressway. The location has now become most desirable after real estate destination in Navi Mumbai for residential space buyers. Navi Mumbai International airport, upcoming Reliance SEZ,number of schools, colleges and hospitals are very easily accessible to meet the needs of its residents. It has ICICI & HDFC Banks in close proximity. It is home to many educational institutes. Kalpataru Waterfront tower lies at Panvel in Navi Mumbai, Maharashtra, India. The Waterfront project is set amidst a beautiful landscape and equipped with amenities like a jogging track, rain water harvesting facility, senior citizens corner,skating rink, gymnasium, swimming pool,24x7 security, power backup and many more.